Do You Remember... "Casey Jones"
A brand new story ‘bout a great engineer. He’s the greatest of them all we claim, Number One’s his engine, Casey Jones his name. Long before Alan Hale Jr. became TV’s famous Skipper on “Gilligan’s Island”, he brought jovial life to the legendary folksong hero “Casey Jones”, engineer of the Cannonball Express for the Midwest and Central Railroad. “Casey Jones” was a half hour syndicated b/w series produced for Columbia Screen Gems by Harold Greene (1916-2000) who was first a writer before becoming a producer on “Casey Jones” as well as “Captain Midnight”, “Jungle Jim” and others. Casey’s 32 episodes were shown originally in syndication from October 1957 to May 1958, although many TV stations continued to run the show into the early ‘60s. 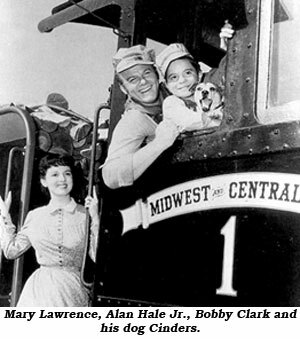 Besides Hale as Casey Jones, the cast included Mary Lawrence (1918-1991) as Casey’s wife Alice; Bobby Clark (1937- ) as Casey Jr. (This is not the same Bobby Clark—aka Clack—that appeared in “Overland With Kit Carson” [‘39] and “Sagebrush Family Trails West” [‘40] among many others, including several Gene Autry Columbia titles); and B-western vets Eddy Waller (1889-1977) as conductor Red Rock and Dub Taylor (1907-1994) as fireman Wallie Sims. Jim Bannon (1911-1984) was a semi-regular as Sheriff Tynes and Paul Keast (1902-1979) appeared as railroad owner Nathaniel Carter. Guest stars read like a western who’s-who: Lee Van Cleef, Ted DeCorsia, Mort Mills, Ray Teal, William Bryant, Bud Osborne, Kermit Maynard, X Brands, Bing Russell, Jan Merlin, Chris Alcaide, Kenneth MacDonald, Lee Roberts, Harry Lauter, Zon Murray, Myron Healey, Denver Pyle, Leo Gordon, Roy Barcroft, Adele Mara, Ed Cobb, Gregg Barton, Anthony Caruso, Dorothy Green, Bill Henry, Tom Keene, Don Harvey, Frank Lackteen and Willis Bouchey. George Blair (1905-1970) directed 23 of the 32 episodes. An assistant director from ‘33-‘43, Blair then worked at Republic as a director on crime and action films and a few westerns with Rex Allen and Monte Hale before moving into TV with Roy Rogers and Gene Autry’s TV series, as well as “Superman”. The prolific Lew Landers (1901-1962) also helmed four episodes of “Casey Jones”. The possible reason for the one-season demise of “Casey Jones” is that the series’ tone was too adult for youngsters, yet not totally geared to the adult audience, leaving the show mired somewhere in-between. 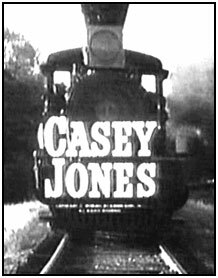 But in retrospect, by possibly over-looking “Casey Jones” as a true TV western, you’re missing out on a really fun series.